Southern Wine & Spirits’ Academy of Spirits & Fine Service is like college in two ways: The level of education is incredible; and if you miss a class, you can always return and take it in the next semester. I’ve done just that this year. I started my first 12-week run this past winter before as they say, life interrupted, and so now I’m back picking up where I left off, at lesson three. Which brings us to yet another way ASFS is like college: this class centered on tequila. But not the drain cleaner most of us drank by the shot in college. In this class we tasted 18 tequilas and one mezcal, the bulk of which were exceptional brands that, had we tasted them at a bar, our tabs would have been at least $200 and possibly $300. The class started, as it always does, with a beverage. This time it was the legendary and easy to make Batanga, a staple in the town of Tequila, Jalisco, Mexico. Here’s our instructor Gary Gruver’s recipe. Moisten glass rim and dip in fine salt to coat. Add ice to the glass, add tequila, squeeze lime wedge and toss in glass, and follow with Coke. Stir with a knife and serve. Yes, a knife. When visiting a bar in Tequila, the bartender stirred our group’s Batangas with a well-used, wooden handled steak knife like you’d find at Outback Steakhouse. And then he used the same knife to chop onion, avocado, cilantro and lime for some of the best guacamole I’ve ever eaten. All tequila is mezcal, but not all mezcal is tequila. That’s history speaking, not laws like we have governing bourbon. But like our bourbon restrictions, both tequila and mezcal may only be produced in Mexico. Mezcal was co-invented the Spanish explorers to Mexico in the 1500s, who noticed natives drinking pulque, a beer made from fermented agave hearts called pinas. The Spaniards applied their distilling knowledge to the pulque and turned it into a spirit dubbed mezcal. Mezcal is made by burning coals to heat rocks in an earthen pit. To that pit pinas from wild and cultivated agave plants are added, and the whole is covered with dirt for long, slow roasting. The pinas are crushed to release their sugary syrup, which is fermented and distilled in amazingly clever but crude assemblages of clay pots, bamboo shoots and, in some cases, metal helmets. In making tequila, only the hearts of cultivated Blue Webber agave are used. They’re cooked in stone ovens or massive steamers called autoclaves. The pinas are then crushed or shredded to release their syrup, which is fermented using wild yeast. Some distilleries use pot stills, others use column stills. Compared to mezcal, tequila is sweet, clean and bracing, though it shares many citrus and pepper notes. Tequila also is commonly aged, though mezcal typically isn’t. Mezcal is produced in very small batches, sometimes as little as 200 cases per year. According to Gruver, for every single bottle of mezcal sold, 150 bottles of tequila are sold. While people are amazed at the number of bourbons on our shelves, it’s nothing compared to tequilas available. Today there are more than 100 distilleries are making more than 1,100 tequila labels, compared to about 350 bourbon labels. For that rush to the back of the liquor pack we credit Prohibition! Tequila knowledge takeaway No. 1: Cooked agave pinas are processed in two ways: they’re either crushed by stone wheel, called a tahona, or shredded mechanically, and each process affects the flavor profoundly. Tahona-crushed pinas tend to produce tequilas that are more mineral and earthy in flavor, while shredded pinas tend to produce spicier, citrusy and more peppery notes. Both are delicious, just different. To my palate, both are fantastic, each serving a unique purpose in telling the story of the agave, and in lending themselves to sipping neat or immersion in a cocktail. Gruver then led us through the 19 spirit tasting, which began with Cuervo Gold. Yes, he had to draw the baseline somewhere, and that’s where he started. Cuervo Gold is what’s called mixto, which means it only has to be 51 percent tequila. The rest can include neutral spirits, flavorings and colorings. Yeah, we all thought it special when we were in college since we knew so little about tequila. Now you should know better. What followed was one of the best bargains on the market, Altos blanco, which costs about $20 for a 750ml. 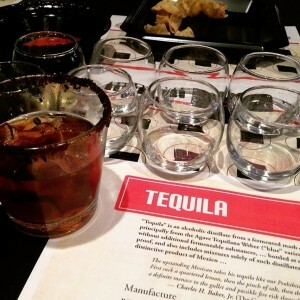 On the heels of that were selections from Patron’s baseline silver, resposado and añejo tequilas, served along with tastes from Casa Noble and Don Julio. I appreciate what Patron has done to elevate the spirit of tequila in the U.S., but for the price, it lacks personality. It’s too cleanly distilled for me. Yet what our next round of tasting included was Patron’s Roca line, which is created using the tahona to crush the agave, plus some added finesse in distilling. That yields tremendous flavor in all three expressions (silver, reposado and añejo), which comes at a price, of course: $69, $79, $89 respectively. Round two also included the venerable Don Julio 1942 ($140 per bottle) and its bright, pepper and citrus notes, followed by the lush, sweet and complex Casa Noble añejo ($79 per bottle). It was fun to watch the sworn bourbon-only drinkers’ jaws drop when tasting the aged tequilas. It also was fun to hear the horrified gasps of some when sipping the lone mezcal. I said it tasted of burnt rubber, others said band-aids and one woman said it reminded her of a fresh can of tennis balls. All are correct. Mind you, this is school, people! This is what about 15 of us were gathered to learn. And as I used to do after three hours of hard studying in college, tequila class warranted a long nap afterward. Next up for Lesson 4: Cognac. “Tequila makes me crazy, so I kinda steer clear of it,” said the woman mixing a batch of paint for me at a shop last weekend. She said that with a roll of her eyes and a grin, implying some past misbehavior born of excess tequila consumption. “That didn’t have anything to do with the amount you drank, did it?” I asked. Again, she grinned sheepishly. “And it probably wasn’t any good to begin with. I don’t know a thing about tequila,” she said. Most don’t. Or at least good tequila. Me included until a few years ago, and even then, I only understood it as the backbone of a really good margarita. As has become the norm with me, I learn the most about any spirit by sipping it straight, sniffing it a lot and sipping it some more. I also like to read about it and consult knowledgable sources (and we have no shortage of them in this town, which is a blessing!) Slowly, over time, 1 ounce in 30 minutes, give or take 10 minutes, in a chair, Kindle in hand. 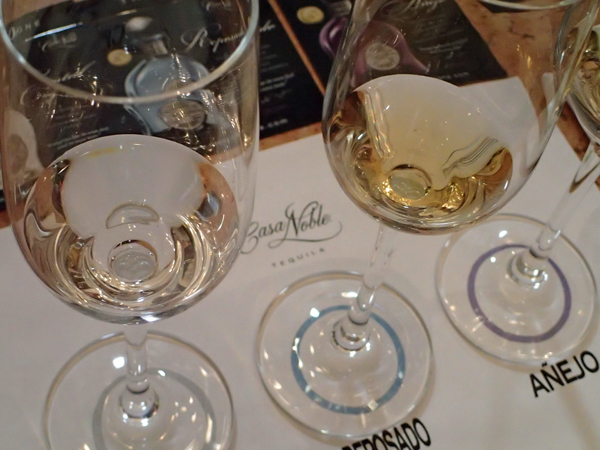 That’s one way you get to know good tequila and its flavors, nuances, colors and aromas. Never by doing shots with salt, lime or lemon. What moron came up with that combo anyway? Easy: The marketing genius who convinced people to squeeze citrus into bad beer. So my first tequila epiphany occurred 12 years ago when a server at Mama Rosa’s—remember that Peruvian restaurant on Breckenridge Lane?—talked me in to having a true top-shelf margarita made from Don Julio Silver. It was terrific, bore some bite with flavors of fruit and white pepper. I almost never had cheap margaritas afterward. 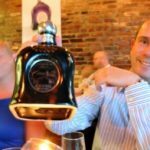 The second and most important lesson spurring my love affair with the spirit came two years ago when Casa Noble master distiller Jose “Pepe” Hermosillo hosted a tequila dinner at The Blind Pig. Nearly every taste was straight, just an ounce or so of “the juice,” as fans call the product of steamed and fermented agave pulp. It was fantastic, loaded with notes of cinnamon, vanilla and citrus, characteristics shared with bourbon, since both are barrel aged. Well, as hooked as one can get on $40 a bottle—and WAY MORE—booze. What deepened my appreciation for it was being invited with a group of food, beverage and lifestyles writers to Casa Noble’s distillery in Tequila, Mexico last winter. When the owner breaks out the good stuff for private tastings, the experience is difficult to convey with written words. The good thing about the high price of great tequila is it forces you to savor it over time. It’s not for every night sipping at Chez Coomes. Sure, it’ll work in cocktails, but pouring great reposado or anejo (1 to 3 year old tequilas) into a margarita is a bit like putting on a tuxedo to fetch the mail. It’s unnecessary overkill for a drink that’s as much about the flavors of its other components as it is tequila. So, since it’s National Tequila Month, I thought I’d share a helpful hints I’ve picked up over the past two years of committed study to understanding what has unseated gin as my favorite spirit. 1. Only buy tequila made from 100 percent blue agave, the plant from which it’s made. There are bargain priced versions of this, so at the very least, start there. It’s also wise to buy tequila made only in Jalisco, the Mexican state that’s home to the town of Tequila. 2. There are three basic grades of tequila: silver, reposado and anejo. Silver (also called blanco, plata, crystal, white and platinum) is generally un-aged, though some brands, such as Herradura, give it a month or so in the barrel for just a little more flavor. Its flavor is bright, fruity and peppery, which make it perfect for cutting through cocktail additives. If you like straight spirits that deliver a bite along with that flavor—and I do—silver does the trick. It’s also less expensive, in most cases, than its older styles. * A sort of sub-category of silver that has developed is worth noting: Joven, which is still-strength, i.e. white lightning, only a tequila version. I tried some at Casa Noble and it was fantastic, but at 126 proof it’s hot and delivers a memorable kick. Reposado is tequila aged two to 11 months in wood barrels that 99 percent of the time are spent bourbon barrels from Kentucky. (Casa Noble, it should be noted, is the only distiller using new French white oak barrels that are lightly toasted, and Don Julio uses some new American white oak barrels for its high-end “1942”.) The bite of silver is softened considerably with some age, and the flavors of the barrel—cinnamon, orange, caramel, etc.—move to the front. 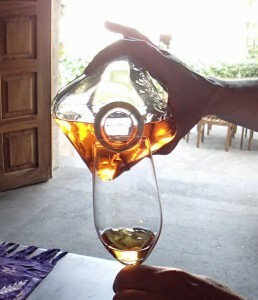 Due to age-induced evaporation, reposado also has more body than silver as well, so its mouthfeel is softer. Anejo is tequila aged longer than 11 months, though the great ones are aged at least two years. Those stretching to three to five years are called extra anjeo, but such varieties are both hard to find and pricey and fetch $100 and more. All the flavors and textures of reposado are amplified markedly in anejo: highly complex barrel notes, weighty body and truly silky softness. Great anejo is savored, sipped and sniffed slowly. Anjeo also must be aged in barrels smaller than 600 liters—which is a huge barrel; a bourbon barrel is about 300 liters—to increase those flavor concentrations. While at Casa Noble, Hermosillo gave us tastes of his “experiments”: a 5-year-old extra anejo held in a 300-liter barrel, and a 5-year old extra anejo from a 100-liter barrel. I’ve never tasted any spirit so good in my life as the 100-liter version. It was worth the harried three-day up-and-back trip to taste just that. (If it ever makes it to market, surely its price would be at least a few hundred dollars.) See the picture above and notice the body of it in the glass. Anything Casa Noble. I haven’t tasted every tequila, but I’ve sampled many kinds. I have yet to find better anjeo. Its silver is bright, aromatic and fun, and worth the nickel. Don Eduardo reposado is a great middle-ager. Floral, warm, inviting, loads o’ cinnamon. Avion makes a terrific anejo that’s got a much lighter body than, say, Casa Noble, but that lack of structure seems to allow some nuances to emerge on the palate. A great spirit all around. Anything Milagro. No better bargain on the market, especially the silver, which costs $23 for a 750ml. Its reposado has great edges that make for some spicy sipping. Herradura tequilas are about as reliable as you get. Nothing fancy, but no flaws. You’ll never go wrong here. Gran Centenario any age. Very pure, elegant and a great standard to go by. But super pricey. Hide it from your friends. So what about Patron or Cabo Wabo (Sammy Hagar’s brand), two very popular tequilas? Both are fine, steady drinkers, but both are cocktail tequilas. Both lack depth and complexity; neither is a great sipping tequila. Patron, frankly, is way overpriced, not a value at all, so I don’t buy it, but will drink it if offered. ** PS: You know how every alcoholic beverage advertisement says to “drink responsibly”? Great wisdom worth practicing. If there’s any chance you want a seat at the upcoming March 14 tequila dinner at the Mayan Café, stop reading and call 502-566-0651. Seats are that few and the $60 per person meal warrants it. When I spoke Tuesday with Anne Shadle, partner and general manager at the Yucatan cuisine restaurant, she said reservations rolled in so quickly she scrambled to arrange for two seatings — one at 5 p.m. and one at 8 p.m. — to accommodate demand. It appears she might have needed a second day for the dinner, not just a second seating. And why, precisely, is a tequila dinner so popular in the middle of Bourbon Country?